Four years after a deal fell through that would expand the public beach at Menauhant, the town had another chance to purchase 1.9 acres of barrier beach, dune and upland at the western end of Menauhant Beach. Drawing on town funds, Community Preservation Act funds and a contribution from The 300 Committee, the town acquired four small lots from the estate of Elizabeth Haddad for $685,000 in 2007. The lots are on Foster Road and Pasnecoy Lane, dirt roads off Menauhant Road. The 700 feet of shorefront at Haddad not only add to the town's holdings of public beach, they play a valuable role in coastal management by helping to nourish Menauhant Beach. In its varied history, the property had a guest house, called The Captain’s House, that burned down. Later, a developer's bid to construct 20 motel units was halted when the town issued a cease-and-desist order; work that had taken place was subsequently destroyed by fire. 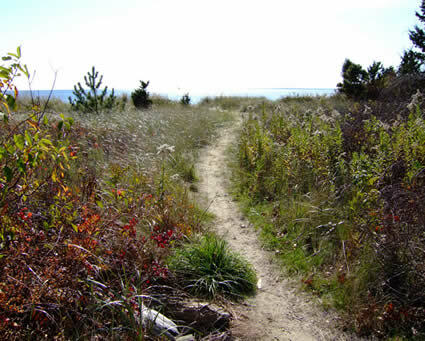 Menauhant is one of the town's largest public beaches, comprising 8.8 acres with 3,000 feet of shoreline on Vineyard Sound. An inlet cuts through the beach to Bournes Pond.